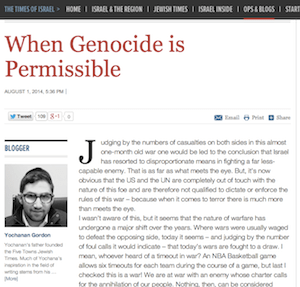 The English-language Israeli publication Times of Israel today published, and then quickly deleted, a blog post by the writer Yochanan Gordon with the extremely inflammatory headline “When Genocide is Permissible.” The post does not explicitly endorse the genocide of Palestinians, but it asks if doing so would be morally justified after building up the case it would be and presenting only evidence in the affirmative. We’ve preserved the full text of the now-deleted blog post below; you can read it for yourself. This is not because Gordon himself is a particularly influential writer, much less a political leader of any kind, but because this post represents an extreme iteration of a much broader problem, in which the conflict and the discourse around it exacerbates and empowers extremism on both sides of the conversation. There is real social science behind this phenomenon, which pushes the politics of the conflict away from peace and toward more hard-line positions, as well as raising voices that de-humanize the “other side” in a way that makes it easier to perpetuate the fighting. Again, this post is obviously an extreme position, which is why the Times of Israel deleted it, but it is most unusual not for his argument for the plain-stated clumsiness of it. Both the Israeli far-right and Palestinian militant groups will at times advocate for the absolute elimination of the other side from the land; they just know how to do it in a way that won’t raise so many eyebrows. “Judging by the numbers of casualties on both sides in this almost one-month old war one would be led to the conclusion that Israel has resorted to disproportionate means in fighting a far less- capable enemy. That is as far as what meets the eye. But, it’s now obvious that the US and the UN are completely out of touch with the nature of this foe and are therefore not qualified to dictate or enforce the rules of this war – because when it comes to terror there is much more than meets the eye.